No matter where you live and what your personal situation is, chances are that you'll face a natural disaster. Hardly a month goes by without a major news event that brings home this point. It's no wonder that getting ready for an emergency or prepping for a natural disaster is such a hot topic. Give your readers what they are looking for with this free content pack. 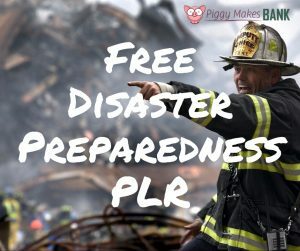 We've put together a FREE PLR pack with content to help you get up and running quickly in the profitable emergency prep niche. Use them on your blog, in your newsletters, or create a new lead magnet with them to grow your list. You get a total of 5 PLR articles and a bonus checklist. You can use this pre-written content as is or edit it as you see fit. Tweak it to fit your niche and your business requirements. Put your name on it and use it in your overall content marketing strategy. If you want to help your readers make sure they are prepared when the next natural or man-made disaster strikes, you can get this incredibly value-packed bundle for FREE. Simply Register Below and receive an immediate download. Do You Know What Disasters You Should Be Prepared For? What Emergency Supplies Do You Need In Your Disaster Kit? That's a total of 5 articles (400+ words each) and a checklist Totally FREE. Give your readers the content they are looking for and help them be prepared when disaster strikes.